For a few reasons we predicted — and one we didn’t. Chris Christie visits voters Tuesday at T-Bones Great American Eatery in Derry, New Hampshire. Chris Christie’s 2016 presidential campaign had one shining moment: the tripwire he set for Marco Rubio in Saturday’s debate (which Rubio somehow tripped over again and again and again and again). But that was the equivalent of a posterizing dunk for a basketball team that had lost by 20 points. Christie otherwise made very little headway in the Republican race, and he ended his campaign Wednesday after receiving just 7 percent of the vote in New Hampshire. In one basic respect, Christie’s problem was simple: He has a relatively moderate track record in a party that’s become very conservative. That was obviously a problem in Iowa, where Christie didn’t even try to compete. But even in New Hampshire, the share of Republicans who identify as moderate or liberal dropped to 29 percent from 47 percent four years ago. Christie had a lot of competition for this slice of the electorate, meanwhile, with Jeb Bush, John Kasich and Donald Trump (who does well with Republicans of all ideological positions) also taking their share. If endorsements are the best measure of insider support, then Christie’s performance was a little underwhelming. True, he placed third in FiveThirtyEight’s tally of “endorsement points” at the time of his exit from the race. But Christie’s support was thinner than that score implies. Christie, the former chairman of the Republican Governors Association, won the support of three Northeastern governors, along with four House members from New Jersey, one from the Philadelphia suburbs and one from Indiana. That’s it. Basically, exactly the people you’d expect to endorse Christie endorsed him, and no one else did; he wasn’t winning the sort of “out-of-group” endorsements (say, an endorsement from a conservative Republican from the South) that are the hallmark of a consensus-building candidate. Was this because of Christie’s lack of discipline, as I asserted in the article? That’s harder to say. Christie may have been punished by Republican elites for past sins in which he seemed disloyal to his party, especially his self-aggrandizing 2012 convention speech and his “bear hug” of President Obama after Hurricane Sandy. But his 2016 operation was relatively disciplined — I would argue perhaps too disciplined, since Christie often had trouble making news. Usually candidates who are too moderate for the party base and too “maverick-y” for party elites make up for it by having a lot of appeal to independent voters. That’s not true for Christie, however, who has a -13 percentage point net favorability rating among general election voters. 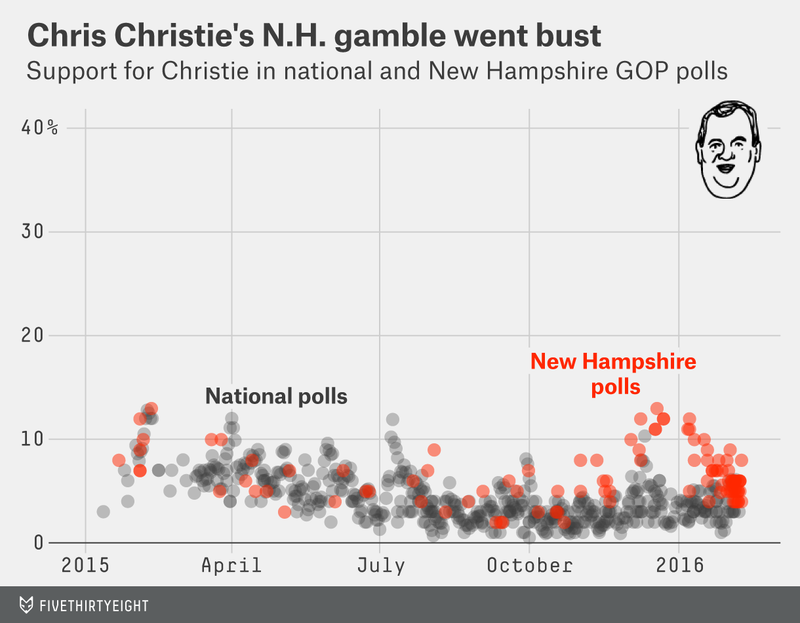 Christie’s numbers improved slightly over the course of the campaign, but not nearly enough to undo the damage wrought by “Bridgegate”; it’s easy to forget now, but Christie was once one of the most well-liked politicians in the country. Other than in these areas, Christie has some strengths. For my money, he was the most consistent debater in the Republican field from start to finish. He’s one of the better retail politicians in the GOP field, as we saw on our recent visit to New Hampshire. But the characteristics I mentioned before — electability and ideological alignment with and loyalty to the party — aren’t just incidental. Instead, we’ve sometimes referred to them as the “fundamentals” of presidential nominations. The eventual nominee usually scores high along each dimension, whereas Christie’s marks were middling across the board. A deficit in these categories is hard to overcome; sheer chutzpah or tactical brilliance usually won’t do it. Unless, maybe, you’re Donald Trump, who has a good shot to win the nomination despite neither being all that loyal to his party, nor all that conservative, nor all that electable. As we’ve written, Trump represented another problem for Christie. He usurped Christie’s brand as the telling-it-like-it-is candidate and as the tough-on-terrorism candidate. Trump has also won a disproportionate share of media coverage throughout the campaign, a problem for all of Trump’s opponents but especially Christie, a showy candidate who was once a media phenom of his own. I suggested earlier that Christie should have run a less disciplined campaign, staging a few controversies to draw attention to himself. Obviously, that’s a bit tautological: It requires a lot of discipline to strategically plant a “viral moment.” But it’s remarkable how few candidates other than Trump understood that attention was the coin of the realm in a field that once had 17 candidates. Christie also missed some obvious opportunities to take on Trump — particularly, when Trump falsely insinuated that “thousands and thousands” of Muslims had publicly cheered the Sept. 11 terrorist attacks from New Jersey. This was everything that Christie was supposed to be all about — 9/11, New Jersey and “telling it like it is” to preach tolerance of Muslims — and yet, Christie responded only meekly, saying he didn’t recall 9/11 as Trump did. In a nutshell, Christie was playing a long game when his fundamentals were unsound, which should have instead proposed a higher-risk, more bombastic approach. By the time his viral moment finally came in last weekend’s debate, it was too little and too late.